vi, 104 leaves : ; 28 cm. Thesis (Ph. D.)--University of Florida, 1987. Includes bibliographical references (leaves 92-103). other family members for their support. Need for This Study . II LITERATURE REVIEW . .
Support for the Problem . Instruments Used in Study . Slosson Intelligence Test SIT) . most methods were less than accurate. seventh grade subjects using two correlational procedures. analyses were found to be the best predictors of "gifted"
erally yield most accurate predictions. Ryabik, 1983; Rust & Lose, 1980; Stephens & Gibson, 1963). their classification according to an IQ test cutoff score. typically administered in concurrent testing sessions. which giftedness is viewed as a dichotomous variable? fying gifted and not-gifted seventh graders? ence skills, science, and social studies. measured by IQ test items. from Hillsborough County Florida School District). gifted are referred to as high-achievers. rationally, and to deal effectively with his environment"
spatial, numerical, and other factors" (Wechsler, 1950, p.
derived total or Full Scale score on an intelligence test. or perceptual organization (Kaufman, 1975). ticu.lar teL st at e he time it was taken" (JJnson, 1980, p.
[scores]" (Slosson & Jensen, 1982, p. 1). tests used in this study to measure gifted intelligence. administered concurrently with the CTBS. inferences from test scores or other forms of assessment. to compare them with measures of achievement. tempted to construct an academic curriculum from it. a second phase of the study no pretest was administered. post-test administration the Stanford-Binet was given. WISC-R and Stanford-Binet studies (Kaufman, 1979). items that cannot be readily reproduced in this format. Tony bought a second hand bicycle for $28.00. much did it cost new? In what way are a telephone and a radio alike? "The white boy is lazy; he walks sitting down! dian to say, 'He walks sitting down'? Some bicycles have ten speeds. P. Maria likes her bicycle. G. Maria's bicycle has gears. H. Maria's bicycle goes too fast. J. Maria's bicycle has ten speeds. grade, measuring both achievement and cognitive ability. tional tests or testing time being needed. the total test (Kaufman, 1979). tions, utilizing these or other tests. The psychometric screening of "gifted intelligence"
tive, but their efficiency was poor. students predicted as gifted were not. IQ of 120 on the Stanford-Binet with a range of 98 to 153.
form perfectly to be predicted as gifted. subtests of the WISC-R or items from the Stanford-Binet. form test was conducted by Thompson and Findley in 1962.
ancies of 6 points or more. ability into account when measuring predictive ability. (X chronological age [CA] = 9.9) served as subjects. racy ratios were not provided in the study. frequency with which each produced an estimated IQ 2 130.
and S-OA dyads. These correctly predicted 62% as gifted. 1973; Slosson & Jensen, 1982; Stewart & Jones, 1976). been predicted as gifted using a cutoff this low. dicting WISC-R IQ of 61 gifted students ages 6 to 11.
first, fourth, and seventh graders with high ability. be used to screen gifted program candidates. validity for many of the factors measured by the test. analytic studies lend credence to this contention. sarily in content (Mercer, 1979). achievement were as high as r=.80. Full Scale correlations not quoted. spelling and arithmetic by the two WISC-R factors. Test (PIAT) (Dunn & Markwardt, 1970) were examined. was comprised of subtests from all three tests. tween some of the other IQ and achievement subtests. students ranging in age from 11 to 18. A "substantial"
found to load on each of the IQ factors. sentence writing and WISC-R Coding were included. 25% of the variance in scholastic performance. in grades four through six. variables are fairly highly correlated. between intelligence and achievement in science and math. achievement and verbal IQ in third graders. IQ are IQ screening tests. proved inefficient in terms of time and cost. .95 based on a 3-month interval between tests. the validity of the WISC-R.
10 and 30 minutes to administer. SIT is 100 and the standard deviation is 16.
correlated coefficients to newer data. 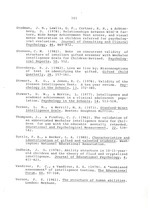 Hill, 1984) are the tests from which NP items were taken. some of which were discussed in Chapter I.
tween subtests and total score ranged from r=.72 to r=.85. was calculated on a sample of seventh graders. in the CTBS and TCS Technical Reports. ing test bias for the CTDS and TCS. difficulty level had altered during the intervening years. previous norms (Terman & Merrill, 1973). 1976). Reliability coefficients range from .83 to .98.
analysis, and from correlations with achievement ratings. the upper age levels, is that employing verbal content. cate that it was an appropriate IQ test for this study. ing 118 students were assigned to Phase I. Skills (CTBS),' and Test of Cognitive Skills (TCS). ferred to the school psychologist for WISC-R evaluation. score is two standard deviations above the test mean. scale scores, the CTBS yields an overall achievement index. students from testing and gifted program eligibility. reducing the accuracy of NP predictions of giftedness. procedure in predicting gifted IQ on the WISC-R.
searcher and employees of the district school board. manner by the researcher and research assistant. than .182, was selected for the NP screening test. ticular sample in which it was obtained (Anastasi, 1976). what cutoff points either the NP or SIT was more accurate. tions that could be expected on the basis of chance alone. classifications for NP or SIT. ranges of ability and particularly at the ceiling level. were purposely included in the CTBS by its constructors. ization by administrators of the CTBS, TCS and the SIT. proposed new procedure in accomplishing its intended goal. students are, in fact, being tested on different scales. parison of scores over age levels. phi, NP-D, and SIT in relation to cutoff scores. * Item discriminates in favor of not-gifted. 2 Answered by less than 90% of sample. dents could potentially attain the maximum raw score. 42 from the CTBS and 5 from the TCS. 24 of the acceptable items were obtained from the CTBS. ically by subtest according to difficulty level. 2) were retained from the CTBS. *Item discriminates in favor of not-gifted. 2 answered correct by less than 90% of the sample. correct responding diminished beyond raw scores of 11.
while 65 received scores within one point of the mean. students also did so on the phi analysis. classifications using the NP-phi, NP-D, and SIT. were the cutoffs -1.0 SD, -.50 SD, +.50 SD, and -1.0 SD. screening gifted students were approximately equivalent. predictions occurred in .082 through .148 of the sample. termine the proportions, if any, that were most accurate. the Kappa equation adjusts for chance correct predictions. sifications at other cutoffs, are located in Table 4-6.
only .178 for the SIT. either the NP-phi and the SIT at all cutoff levels. guishing between gifted and not-gifted seventh graders. fewer discriminating items than did the phi analyses. had the N been as high as 113.
original CTBS sample, suggest commonality in responding. expected to answer these items correctly. greater (16 of 24, 67%). alent sample was conducted to support these findings. tions using coefficient Kappa analyses. values for NP-phi (.076) and SIT (.204). two NP tests, NP-D was generally superior to the NP-phi. and negative classifications based on Kappa analyses. itations germane to both pragmatic and theoretical issues. initions, may involve other qualitative differences. IQs falling above the 96th percentile. ities among children with discrepant report card grades. TCS items (which are purported to measure intelligence). Indeed, none of the NP-D items were obtained from the TCS. cognitive ability items for Full Scale IQ. than refute the generalizability of research findings. the skills that are measured by the 11 WISC-R subtests"
tests) for high achieving or gifted students. (e.g., WISC-R) are often operationally indistinguishable. (1982), among many others (see Chapter II). mean (SIT IQ = 149). easily replicated on new student samples and test formats. to varying, yet specific, needs. Park, NJ: The Gryphon Press. and Evaluation in Guidance, 16, 25-35. Barrington, B. L. (1979). In the name of education. In N.
nal of School Psychology, 9, 310-320.
necessary? Gifted Child Quarterly, 28, 157-161.
achievement measures for learning disabled children. Psychology in the Schools, 19, 297-304.
dren. Exceptional Children, 26, 145-150. Chambers, J. A., Barron, F., & Sprecher, J. W. (1980). gifted. Gifted Child Quarterly, 29, 113-119. Technical report. Monterey, CA: CTB/McGraw-Hill. ities. Clinical Neuropsychology, 4, 58-62.
and Psychological Measurement, 40, 543-545. Dirks, J., Wessels, K., Quaforth, J., & Quenon, B.
Ebel, R. L. (1965). Measuring educational achievement. the Schools, 43, 426, 428.